Casa Billi i Firenze, Italien: Reservér nu! Cancellation policy: the first night will be charged at the moment of your reservation. In case of late cancellation the same amount will be kept. Cancellation 2 days before check in: 80% of total amount. Cancellation during the stay: 90% of total amount. In case of NO-SHOW, the sum total will be charged on credit card. rooms with bathroom), shampoo & shower mini-soap bags and guide map. 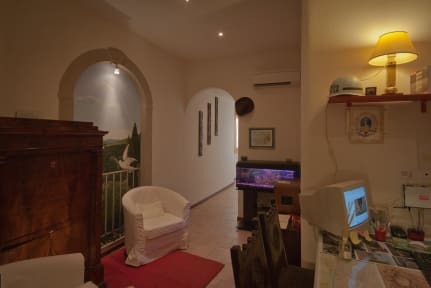 You can relax and stay in Florence in Casa Billi feeling you like at home. The modern atmosphere will make your vacation in Florence unforgettable. Thank you for your choice. Please remind to confirm your check in time; below the sales conditions related to your booking. We take preauthorization on your credit card. We preauthorize the amount equal of the first night of your stay, if the transaction is denied we may cancel your booking. Should you wish to change an existing reservation, you are required to cancel the existing booking and proceed to create a new reservation. introduce the tourism tax, applied to non-residents overnight staying, for a maximum of 10 consecutive nights.